Home > Events > An International Workshop on Outcome Based Education. Outcome Based Education is transformational way of bringing quality in education and ensuring success by activating all components of education. It was expressed by Malaysian Professor Ir. 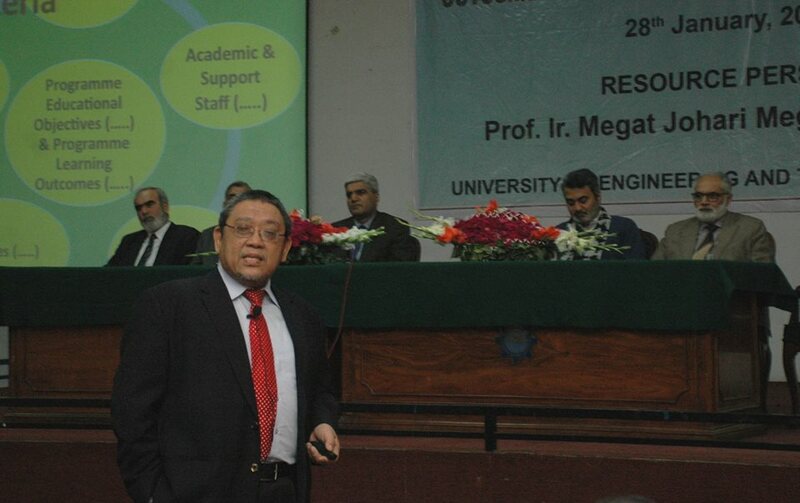 Megat Johri Megat Mohd Noor while delivering lecture in an International workshop on Outcome Based Education and its implementation held at University of Engineering & Technology Lahore. He said that the era of teaching has been over and now it is time of learning through teamwork to bring all stakeholders close to each other for new path of development through education. He also stated that things are being redefined to face the challenges of upcoming era so educational institutions should play dynamic role of change instead of its conventional way of delivering. Prof. Megat stressed to adopt the international standards to meet the demands of market and in this regard, curriculum development pedagogical techniques, linkages with industry should be the focusing areas. In workshop Vice Chancellor UET Lahore Prof. Dr. Fazal Ahmad Khalid said that precision, flexibility, assessment and participation are the core values of OBE which always encourage the universities to get progress and bring change in deliverance. He said that OBE is paradigm shifting from conventional education to result oriented learning. It provides new wave of observing world and occurrences. Keeping in view the importance of this approach UET has been implementing it since many years with its true spirit. In the connecting, academic departments and other supportive quarters are being persuaded to improve the quality of education. VC revealed that the adaptation of international standards will be helpful to get top position in international ranking of universities. And UET is taking many moves to attain the goals of development successfully. In this event, Deans of UET namely Prof. Dr. Abdul Sattar Shakir, Prof. Dr. Ghulam Abbas Anjum, Prof. Dr. Nadeem Ahmed Mufti, Prof. Dr.Nadeem Feroze, Prof. Dr. Shahid Rafique, Additional Registrar Pakistan Engineering Council Dr. Nasir, Registrar UET Muhammad Asif and other senior faculty were present. A shield was presented to the Prof. Dr. Megat Johari Megat Mohd Noor.